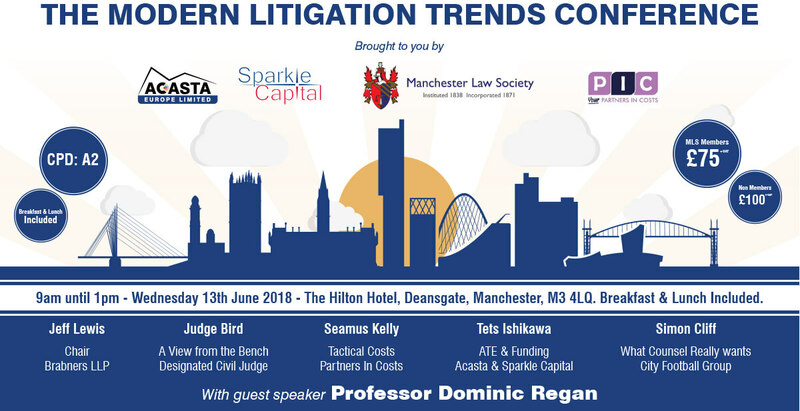 After the success of the Modern Litigation Trends Conference in 2017, we are pleased to announce Acasta Europe and Sparkle Capital will be bringing Professor Dominic Regan, Tets Ishikawa and Seamus Kelly to Manchester on the 13th June to offer their yearly update and expertise in the litigation trends of 2018 heading into 2019. This year they will also be joined by Simon Cliff and His Honour Judge Bird. In partnership with the Manchester Law Society, this half day conference will be to review the important changes in litigation following on from 2017 and what they believe the major factors to consider will be going forward. At our last event, we heard Professor Dominic Regan provide his uniquely positioned insights into the Jackson fixed costs proposals, an effort to weed out pointless litigation activity, and disclosure being cut back, and gave answers and advice for litigators going forward into the New Year. David Kearns from Acasta Europe & Sparkle Capital shared his experience and thoughts on the changing world of litigation and how offering After the Event insurance and Third-Party Litigation Funding is crucial when considering a case and how this financial support can be tailor made to suit firms and litigation procedures. David welcomed questions regarding litigation finance and cleared up some misconceptions such as the need for an ATE policy to be in place or that a solicitor must be on a CFA before funding can be considered. Reuben Glynn’s expertise is invaluable when it comes down to costs. Rueben delivered a comprehensive and detailed report into the changes we are seeing in the courts and the crack down on the charges for unnecessary time spent on cases from experienced solicitors. Rueben from PIC Costs provides a complete range of costing services including complimentary training sessions specialising in Civil Litigation Claims. The Manchester Modern Litigation Trends Conference 2018 will revisit all of the areas discussed at the 2017 event and the new challenges faced in litigation, along with specialist advice for the year ahead. To register your interest in the event, please contact elizabeth.cawley@acastaeurope.co.uk. Alternatively, you can book your place online through Manchester Law Society.